When we travel to Spokane to visit my family, my mom always asks me for a list of food/drink and personal care items she can purchase before we arrive. Her goal is to make us feel at home and, of course, spoil us. Aside from the ice cream, jalapeno chips, Costco muffins, cheese tray, Oreo cookies, Papa Murphy’s pizza, Blue Moon, and Cinnamon Toast Crunch requests, I also ask for a case of bottled water. However, I always specify that the bottled water should be of the Fred Meyer brand. My mom, who thinks I make the request solely to be annoying, goes out of her way not to accommodate it. Even though she does her shopping at Fred Meyer for 80% of the items listed above, she doesn’t buy Fred Meyer water. About seven years ago, I started to prefer Fred Meyer bottled water. When I would return home for the holidays, that was the brand my mom had in the refrigerator. I grew to like this particular bottled water because the spout/cap size of your typical 16.9 ounce container was a tad larger than your typical bottled water spout, inspiring me to call Fred Meyer bottles of water “big mouths.” The green labeling was also aesthetically pleasing to my eye. 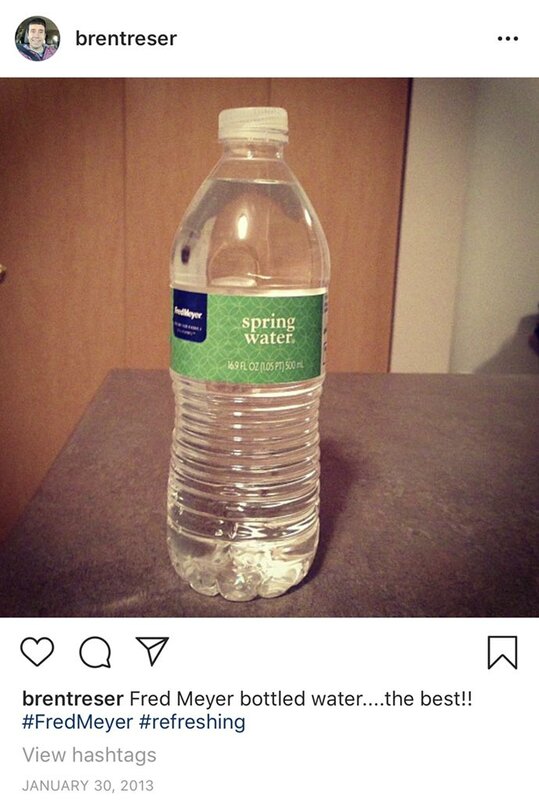 Over six years ago, I documented my love of Fred Meyer bottled water on Instagram. Up to that point, I didn’t really have a favorite bottled water preference. But after my introduction to Freddy’s water, my attitude changed. Since I haven’t lived in a city with a Fred Meyer location since I graduated high school, the only time I would get to enjoy a “big mouth” was when I returned to Spokane. However, over the years, something happened to my favorite bottled water. Although the green labeling is still as green as ever, the wide spout size is no longer a thing. A bottle of Fred Meyer water is the exact same size dimension-wise as a Great Value 16.9 ounce bottle or a Kirkland 16.9 ounce bottle. Of course everyone in my family called BS and it likely motivated my mom even more to start buying Kirkland water. But I held firm to my claim that Fred Meyer water tasted better. Did I actually believe it? To a very small, psychological degree – yes. For the past half of a decade, after the spout size no longer mattered, I lobbied my mom to buy the Fred Meyer water based on my opinion that the water simply tasted better. The more I told her that I needed it, the more she told me NO. Well, I was finally put to task. 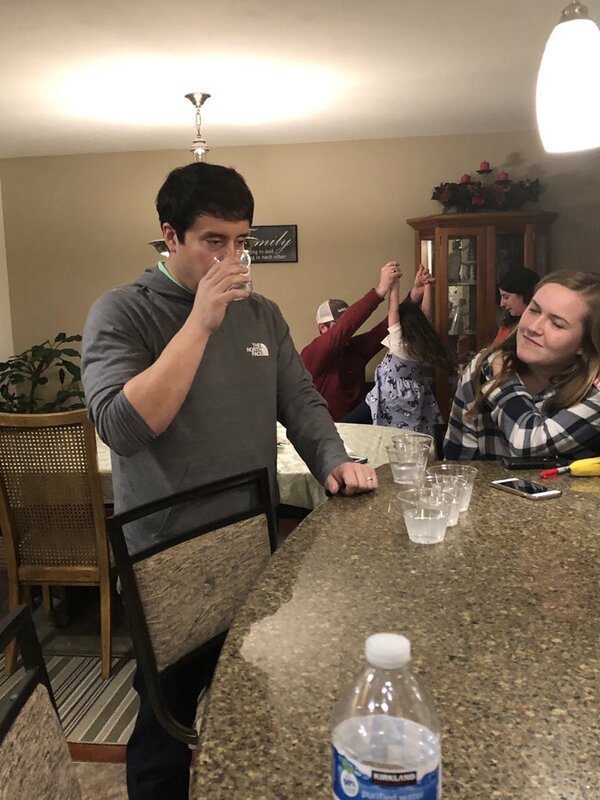 Sidney and my brother’s girlfriend basically said “enough is enough” and made me prove my claim that Fred Meyer water is in fact better than bottled water competitors. The last night we were in Spokane during the holidays, they organized a taste test for me! Controlling for all variables, they provided me with six plastic cups. Two cups contained Fred Meyer water, two contained Kirkland water, and two contained tap water. 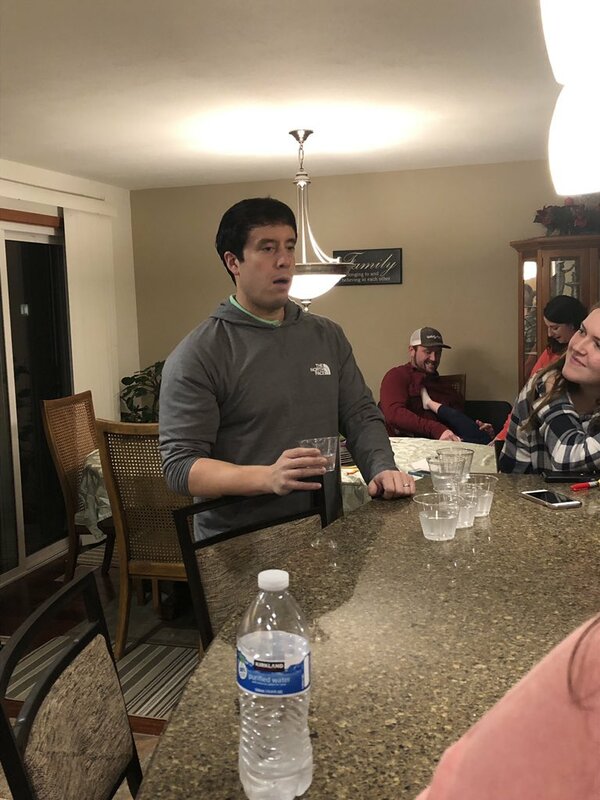 In front of my whole family, they had me taste the water samples and identify the Fred Meyer H20. It was time for me to put up or shut up! My bottled water preference was put to the test! I identified one Fred Meyer sample as tap water and the other as Kirkland water. I identified one tap water sample as Fred Meyer water and the other as Kirkland water. 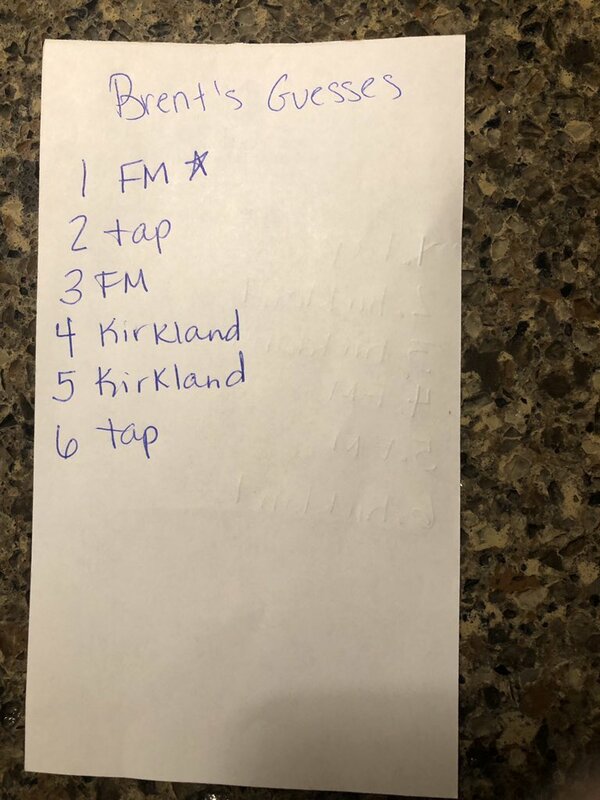 Sure enough, I identified one Kirkland sample as tap and the other as Fred Meyer. I could not have performed worst. I didn’t know the taste of Fred Meyer water like I thought I did. I was a little embarrassed and, rightfully so, I received some good-natured teasing from my family. I have final admitted that Fred Meyer water isn’t all I cracked it up to be. Does that mean I will stop bothering my mom to buy a case when we travel to Spokane? All of my guesses were wrong!